A lovely waterfall that is divided into several smaller drops that make it impossible to photograph in it's entirety. The total drop would be well over 100 ft. It is right beside CR-633 and is reached by taking US-60 from Buena Vista, then turning on CR-605, before the final turn onto CR-633. There is a small pull-off on the right side of the road a little past the top of the falls. Care should be taken in scrambling around the bank of the falls, it is very rocky, usually wet or ice covered, and potentially dangerous. Yes these are beautiful falls but dangerous. One of my daughters best friends was killed here from a fall recently. Some beauty is best viewed from afar. Thanks for the information. I went there today with my family. I agree that it is treacherous - especially with small children (mine are 5 and 2). We opted not to explore too much above the top falls. The scenery and makeup of the falls is wonderful. The best waterfall I have seen since living out west! Join in and write your own page! It's easy to do. How? 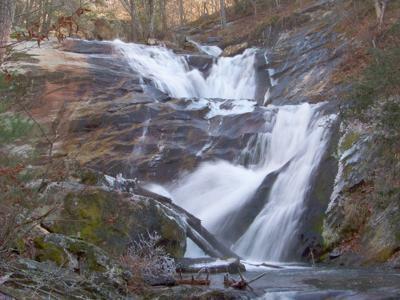 Simply click here to return to Submit Virginia Waterfalls.